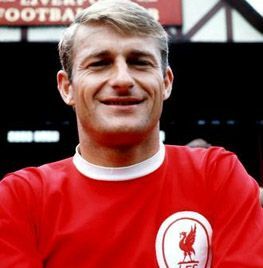 The only player to have an honorary knighthood bestowed upon him by the Anfield faithful, Roger Hunt is one of the most popular figures ever to pull on the red jersey. Quite why he wasn't made a 'Sir' by the Queen is still hard to fathom, especially as he was the only Red in the starting line-up when England won the World Cup in 1966. The exploits of hat-trick hero Geoff Hurst mean he's sadly overlooked when a dewy-eyed nation reminisces about '66, and it's easy to forget he was regarded as one of Alf Ramsey's key men going into the tournament. It was for his achievements at club level, however, for which Hunt will always be remembered on Merseyside. Until Ian Rush came along he was the club's all-time record goalscorer, and to this day no-one has scored more for the Reds in the league. Without his many net-busters, Liverpool may never have escaped the depression of life in Division Two and regained their mantle as the country's top team. Spotted by ex-Red Bill Jones as a 21-year-old plying his trade for a local amateur team, Hunt was signed by Phil Taylor and scored on his debut at home to Scunthorpe. Who was to know the strike would open the floodgates – and that they'd remain ajar throughout the entire Swinging Sixties? Although new boss Bill Shankly embarked on a mass clear-out of playing personnel upon succeeding Taylor in the Anfield hot-seat, young Hunt's position was never in jeopardy. Shanks was a big admirer and immediately entrusted the 'Blonde Bomber' with the responsibility of spearheading Liverpool's charge back to the top-flight. In 1961-62 he did just that, plundering a remarkable 41 goals from 41 games as the Reds went up as runaway champions. His partnership with Ian St John has since passed into football folklore and together they went on to terrorise First Division defences. Hunt top-scored when the title came Liverpool's way in 1963-64 and again two seasons later. And it was he who opened the scoring when the Reds finally ended their extensive wait for an FA Cup in 1965. Despite his deadly finishing instincts, the Cheshire-born forward was also known for his workrate. Fast and strong, he would run himself into the ground for the Liverpool cause and was a handful for even the most accomplished of defenders. In January 1968 he overtook the great Gordon Hodgson as the club's all-time leading goalscorer with a typical poacher's strike at Stamford Bridge but the end was nigh for the Kop favourite. As Shanks started the construction of his second great side, an ageing Hunt was one of the first casualties and he bade the Reds a fond farewell the following season. Three years later, the 5ft 9in striker stepped onto the Anfield turf for one final time for a well-deserved testimonial. The gates were locked hours before kick-off as fans clamoured to pay their respects. An astonishing gate of 56,000 was recorded, with many thousands more reported to be locked outside. If anyone had ever doubted his popularity among Liverpudlians, they had no ground for argument after this amazing show of support. Belated recognition of the vital role he played in England's finest hour finally arrived at the turn of the century when he received an MBE but it went almost unnoticed by Kopites - because they had honoured him when it mattered.